Don’t laugh, but I think this post might be the closest I have come to service journalism on this site. I say this because, honestly, I have no idea what I am going to do with three batches of cranberry sauce I’ve cooked over the last week, but if at least one them makes it home with you, I suppose this effort won’t be a waste after all. Is this as noble and un-self-serving of me as it sounds? Of course not — I love cranberry sauce — I just have a little bit more than a two-person household should ever need. I’m not sure if it was because I was a vegetarian and without the turkey, the cranberry sauce made no sense, because I thought it always came from a can in a fun-to-play-with but terrifying-to-eat cylinder, or because I just didn’t like it, but I never ate cranberry sauce growing up. 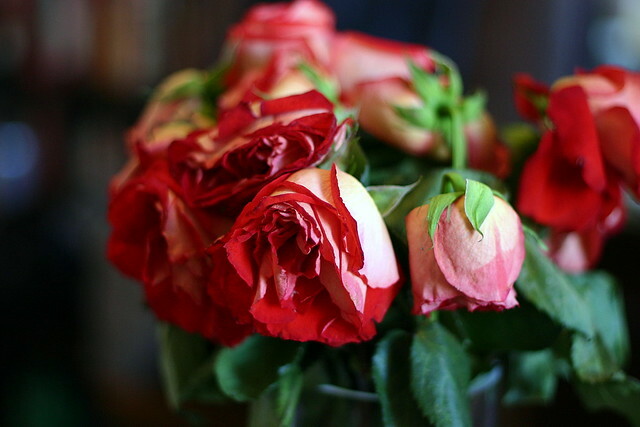 It wasn’t until my first year in New York when I lived in a worn and infested fourth-floor walkup on Avenue B with my friend Dan that I had the real deal, and completely fell in love. Dan’s from Massachusetts and from what I understand, they take cranberry sauce pretty seriously up there, or at least he did, simmering, zesting oranges and carefully sifting through the rinsed bag for deflated or still stem-attached berries. This classic cranberry sauce recipe (which I am sure he’ll tell me I’m getting wrong) will always be my favorite, stirred into plain or vanilla yogurt or simply taken spoon-to-mouth. I hedge on the sugar a little, preferring it on the tart side, but I never skimp on the orange peel, as there’s a reason it is so often paired with cranberries: they bring out the best in each other. A few julienned or thick-zested strips in the sauce is one of my favorite parts; simmered in the stunning rouge syrup, they candy like an orangette, and are a fantastic surprise when you run across them in your hungry tasting. Lest you need any more evidence of its greatness, look how little we have left from a week ago. The final recipe is a new one and for the record, my husband was absolutely horrified at the thought of it, but I persevered. I mean, port? Love it. Balsamic? Ditto. Dried figs? Yum. Black pepper? Intriguing. Rosemary? Could be. Brown sugar? Hells yeah. All together with cranberries? Er, ah, …it took me an hour to even try it and even now, I’m just not sure I fell in love. (Right now, Alex is biting his tongue, but I’m sure it won’t be long until he says “told you so!”). It’s … (hang on, let me try it again) … wine-y. I think it would go well with turkey, or even some roasted potatoes. I’m just not sure it’s good for spooning, and if there’s anything the above two recipes should hint to you, it’s that I like the stand-alone cranberry sauce. At your Thanksgiving table, however, I’m sure it will get no complaints, a sauce for the sauced grownups, if you will. Combine water and sugar in a medium saucepan. Bring to boil; add cranberries and zest, return to boil. Reduce heat and boil gently for 10-14 minutes, stirring occasionally. Add a few squeezes of fresh orange juice. Cover and cool completely at room temperature. Refrigerate until serving time. Break up the jellied cranberry sauce into chunks in a large bowl. Add remaining ingredients. Stir. Frozen berries will melt as it sits. Combine first 6 ingredients in medium saucepan. Bring to boil, stirring until sugar dissolves. Reduce heat to low and simmer 10 minutes. Discard rosemary. Mix in cranberries and 3/4 cup sugar. Cook over medium heat until liquid is slightly reduced and berries burst, stirring occasionally, about 6 minutes. Cool. Transfer sauce to bowl; chill until cold. Do ahead: Cranberry sauce can be prepared 1 week ahead. Cover and keep refrigerated. I make three versions of cranberry too … as usual, the photos are inspiring! This is great. Thank you. I am going to make it for Grandma’s Thanksgiving dinner. I will make it the day before, so please be on Standby so i can call and ask you what the hell julienned means. I love this! I am a cranberry fanatic, from making sauce to muffins to scones. I honestly would invest in Ocean Spray, if I had the financial resources, just to support the cranberry industry. I probably go through several bags of craisins (dried cranberries) a month at work alone. I’ve never tried cranberry sauce in my yogurt…I’m so going to try that one day! I rarely make it, since I live alone and my boyfriend is in Texas. Thank you so much for posting some beautiful photos of your glorious sauces, you made my mouth pucker and water at the same time. I’ve never actually had any cranberry sauce that wasn’t can shaped. I didn’t know cranberry sauce came any other way! I might have to try my hand at one of these recipes soon. Each one of these looks like it has serious intentions realized! I must try at least one soon. I just used my 3 lb bag to make juice and next I want to do the coffee cake I did last year. Then it ought to be Thanksgiving and one of these should be on the table. To the top recipe add/do the following..
Reduce the water by like 1/2… replace it with orange juice AND lemon juice… near the end of the cooking add some Vanilla..yes, thats right Vanilla.. I was like you till about 4 years ago about cranberry sauce.. blah hated it.. seemed pointless sitting there with all the other beautifully cooked items on the table.. i gave it a try 1 year.. i was like.. cmon people it’ll be yummie i swear (with a can on standby in the fridge “just in case”) It was totally gobbled up. The Vanilla adds a lil some some and it makes perfect sense once you try it… next time you make it, add a lil, please, do it for me… you’ll thank me. My favorite dish, next to the stuffing. Now I need a recipe for string bean casserole and sweet potato casserole. I’ve already got my Mom’s recipe for stuffing. I think the dogs and I are going to have our own Thanksgiving feast since my Dad is pretty stingy with the leftovers. I forgot to metion that we’ll probably be doing fried turkey. My friend has an excellent recipe for the marinade that we inject it with. Okay. The journalist side of my brain must pose the question. Why are you a vegetarian? How long have you persued the lifestyle? Any regrets? Just can’t leave my day job alone…. And the sauces, by the way, do look intriguing. No doubt we’ll have them alongside our bird. And as I was reading early in the post about your excess, I was going to suggest you use them to glaze a pork roast — it is especially delish this time of year. Then I read the next piece about your food choices…and thought that’s a wasted idea! LOL! About not eating cranberries as a kid, I didn’t either but I love them now. I read somewhere that as you age you lose your bitter tastebuds or something like that, so you start to enjoy bitter foods that you didn’t like as a kid, such as cranberries or broccoli or what have you. I’ve always put a splash of bourbon in my Ocean-Spray-adapted recipe, but I’ll try it with orange peels as well this time! I have to admit, I have always *cringe* been a fan of the canned stuff. But this year I am seriously considering making a batch of my own. I mean, if I liked the canned stuff so much, I should LOVE fresh right?? Have you tried the Mamma Standburg’s (may be spelling it wrong) cranberry relish from NPR. It’s got sour cream and a little bit of horseradish in it–i’ve never tried it (it’s not for spooning, and i’m a vegetarian) but it’s a favorite at Thanksgiving. Just google NPR cranberry relish, and you’ll be sure to find it. ohhhh the second recipe is GOLD. 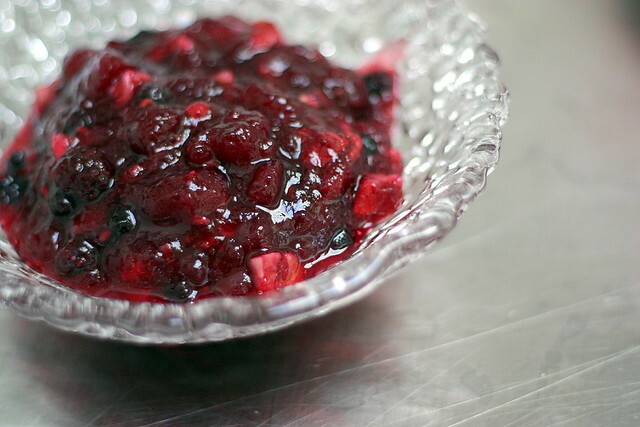 i have a step by step instruction for mama stamberg’s cranberry relish on my site. it’s a glorious savory relish that is a melange of flavors with cranberry as only one element. i serve it every thanksgiving. I had the small but essential job of providing the cranberry sauce this Thanksgiving. Usually I go for chutney-style, but when I found myself at the grocery store without my list of ingredients I could only recall Alex’s Mother’s recipe. It was so simple and absolutely delicious! Thank you! My family loves cranberry sauce — even though they are all vegetarians. We don’t do the turkey thing, but we have everything else including stuffing with a really good vegetarian gravy. I love the cranberry recipe with the orange peel. It’s very close to the one I make — I just make use of the whole orange by juicing it and substituting the freshly squeezed orange juice for the water. Really good. You MUST try Ina Gartens Cranberry Compote. OMGoodness…it’s the best. I probably made 5 batches of it between Thanksgiving and New Years 2007. We couldn’t get enough of the stuff. I’m on cranberry duty from now on, according to the family! Oooops…Cranberry CONSERVE is the name of Ina’s recipe. I made the homemade whole cranberry sauce today to serve with a roasted pork loin. It was delicious! I’m making a double batch this weekend for two early Thanksgiving dinners. Thank you for an easy recipe that tastes superb! I made the homemade whole cranberry sauce recipe over the weekend for Canadian Thanksgiving – I was amazed at how easy it was, and how different it tasted to what I am used to (the Australian jar of cranberry sauce) Loved hearing the cranberries pop in the saucepan too! I am keen to make it again, just so I can tinker with the seasonings and flavours! With Thanksgiving approaching, a plug for fresh cranberry sauce. We always have it on the table along with a cooked kind. And it’s yummy over yogurt later. Make it a day or so ahead of time, just pulse a bag of cran (ok if still frozen) with 1 navel orange (cut into maybe 8ths?) and mix in 1 cup of sugar. Sometimes a little chopped crystalized ginger is good too. Just don’t overprocess, you want small bits but not mush. Time to make this again! I can’t remember where I got the recipe, but I made a fabulous cranberry sauce with maple syrup and walnuts, unfortunately cranberry sauce is not a very big hit with my husband’s family, with whom we usually spend the holidays, so I haven’t made it in a while but I think I will again and add a little orange zest too. The original is my favorite, however I substitute apple cider for the water for some added pizzaz! This time around my sauce didn’t gel as much as it has in the past cooking times. Is there any quick fix? I make a similar version of the “homemade” version (#1), but I swap orange juice for water and add a pinch of cinnamon and nutmeg. I like to add nutmeg, pineapple, and clove with orange. Canadian Thanksgiving is coming up and, as I love homemade cranberry sauce, I volunteered to bring it as my contribution. My trusty recipe is the one on the back of the bag, but I wanted to try something new this year (in the past I’ve had big success with cranberry chutney, but I’ve lost my recipe – anyone have a good one?). I was drawn in by the promise of drunken cranberries, but if Deb didn’t fall in love I figured I wouldn’t either. In the first recipe I liked the idea of adding orange. And I liked Krissa’s idea of adding a splash of whiskey. The result was divine (although the real test will come on Sunday). I followed the first recipe, but substituted some of the water for about 1/3 cup whiskey (a little more than a splash, but not overwhelming). The final result was a bit sweeter than the standard recipe so I would dial back the sugar a bit (but then I like mine tart). Also, if I’d had some cloves, I would have thrown in a few. Question: Deb, do you leave in the orange zest or remove it? I removed it as mine was a bit big, but it was tasty. Last year, my sister in law made the one I think your mother in law was referring to (from Saveur – the cranberries were roasted and there was a jalapeno involved) and it was insanely delicious. I’d love to see your take on that. Was browsing for cranberry sauce recipes to send to school with my three year old sons tomorrow. I didn’t think jalapeno would be quite as friendly to preschoolers, so I’ll probably go with your first recipe here. Cranberry sauce…. I can never get enough, but unfortunately like Kirs my experience is limited strictly to the can-shaped. I’ll have to give this a try! Hi, Deb, or any poster.. noticed at the end of the third recipe you said the cranberry sauce could be made ahead and kept for a week, is that all of them or just the port wine and fig one??? gonna try the first and second ones.. thanks gonna be my first time making from scratch, always used canned…. I think that all three would be good in the fridge for almost a week. Alex’s Mother’s – Yup, I laughed! I’m going with the first one. The recipe is great, I used the entire orange for juice and zest pieces. I also added two tablespoons of maple syrup with the homemade recipe, all things went well together. Very happy and it wasn’t hard to make at all, crowd loves it! J ust had to say that I made the first 2 recipes for thanksgiving and they were both a hugh hit, everyone loved one or the other or both, and I even got asked the recipes from some, so that is always a good thing, lol…Thanks again, Deb…. I love Alex’s mother’s cranberry sauce. I think it’s going to be my new favorite. 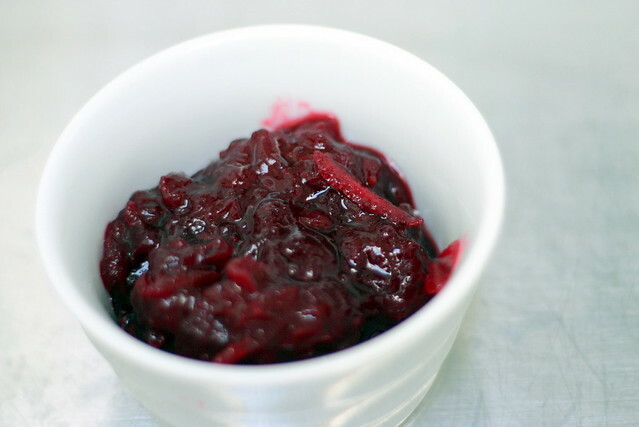 There’s an excellent cranberry relish in Anya von Bremzen’s Please to the Table in which you simply blast raw cranberries in a food processor with sugar and a touch of red wine vinegar and horseradish. Sounds mad but it’s delicious and of course very easy. Definitely to be eaten as a relish for meat or something else savoury, but it’s a lot of fun. Kate — Ooh, I have that wonderful book! Thanks for the tip. I love, love, love Bon Appetit’s Nov 1998 cranberry sauce with dried cherries & cloves. It’s the perfect combo of tart and sweet and I really like the clove touch. Hey Debbie! Making this sauce for my family AGAIN this year (Dan’s version). Thanks! You’re the best. I made cranberry sauce from fresh, whole cranberries for the first time this year, as I did not grow up in New England. It makes ALL the difference. Yum!!! would any other dried fruit work in place of figs? I can’t seem to find any. Boo. Jen — Yes, use anything else you’d like in there. It’s a flexible recipe. I never had the urge to eat canned cranberry sauce…but have decided to make it from scratch. Thanks for a great recipe (Dan’s)! Just made it and it tastes yummy. Can’t wait to try it with turkey tomorrow. Yum! Fresh cranberries are unavailable here, so my own adaptation of your family’s recipe was to boil dried berries in water with just a little brown sugar (since the dried berries are already sweetened), along with the orange rind and the splash of juice at the end. I also threw in a few frozen blueberries because, why not? SO amazingly delicious. We do the back of the bag recipe but skimp on the sugar and add frozen strawberries. So yummy! I just made Dan’s recipe, with the addition of a little bit of ground cloves (as someone suggested). I want to eat it all with a spoon and lick the pot. Deb, did you ever make the fresh cranberry relish? The cranberries, through a grinder, combined an apple and a whole orange, also put through the grinder, and all mixed together. Add sugar to taste (quite a bit) and make the day before you plan to eat it so it can mellow a little. An amazing take on cranberries! Quick re the boozy recipe…do you think it’s adult only, or will enough of the port burn off that kids can have some, too? I LOVE cranberry sauce but my mom and I have always been the only two that eat it at family Thanksgivings. More for us! Even though it’s not sauce you should really try this delish cranberry salsa. 12oz of fresh berries, 1 1/4 cup sugar (you can use less) 1/4 C green onion, 1/4 C cilantro and a jalapeño (seeded or not) pulse in the food processor and then let rest in the refrigerator. Pour over two blocks of cream cheese. Serve with crackers or tortilla chips. OMG! So good! This sounds really good. I’ll be trying this very soon. Thanks, Randi. Alex’s Mom’s recipe is going into the file — it reminded me Many years ago you could buy cranberry relish in a small plastic white tub, next to the cans. You could get cranberry orange or cranberry raspberry. I’ve usually made my cranberries with orange, and almost forgot about the berry version. There is nothing better than a thick slice of toast with some cream cheese/yogurt cheese and a smear of cranberry sauce as morning nums or just before bed with a cup of tea. Also, “Alex’s Mom’s recipe would make a good filling for a galette. I put 40 lbs. of cranberries in my mother-in-law’s freezer last year. It’s safe to say they are my favorite food. I cook 2 lbs. with 1 cup water, 1 1/2 cups sugar, 1 large tub of raspberries, and a heavy pinch of salt. It goes on top of plain Greek yogurt with sugar free muesli, wheat cereal, and raw walnuts. We always just throw a bag of cranberries and an orange in the food processor and than sugar to taste. It lasts forever and is so good cause is fresh. I have never made a cooked sauce and don’t care for the canned variety. I make my mother’s cranberry relish which I was raised with and make every year. She used a grinder and ground the ingredients, but I now use a food processor. Bag of cranberries, an apple, and an orange with a cup of sugar mixed together at least 4 days before Thanksgoving so everything has time to blend together. It is my favorite food besides my stuffing at Thanksgiving. Gail, my mum and grandmother used to make a very similar relish, sans apple! My go-to sauce is pretty close to the classic back-of-the-bag, but I usually throw in some julienned dried apricots. Tasty, and so pretty! About 10 years ago I was making my standard cranberry sauce and noticed a bottle of Tequila on the counter. Magic. A little Tequila added after cooking is VERY tasty. My family would mutany if I forgot it now. Ok, I’m going out on a limb and making the boozy cranberries. I know several someone’s around here who will eat them right up, no matter how weird they are. Plus I’ll be serving the canned stuff as well. I know it’s not very cool, but it’s tradition. We weren’t allowed geletain products growing up, and the canned cranberry sauce was as close to jello as we could get, so it was always a thrill to eat it as a kid. Plus, it’s easy slicing format is perfect for between a sliced sandwich roll with a tiny bit of mayo and some turkey as a midnight post-Thanksgiving snack. You have solved the problem of the day! I bought my cranberries at the farmer’s market, which means that I don’t have an Ocean Spray bag to use as my recipe. But now, I have your lovely recipe. I will have to try the port and fig recipe when I’m cooking for a crowd with more adventurous group. Wow. I’m tired. Just when I’m cooking for a more adventurous crowd. I need another nap. Just made the cranberry sauce with the port and dried figs. Inadvertently bought tawny instead of ruby port but the outcome was absolutely fabulous. This recipe is a keeper. Thanks for sharing! Deb – How early can you make these, especially the first recipe? I was thinking definitely 24 hours in advance, but was wondering about 48? Easily 48, if not longer. I’m with you on the cranberries – so glad we finally bought a freezer when they were on sale last summer. I can stock up on cranberries now and have sauce all year! I’ve been making variations on the back of the bag recipe, but now I’ve got to try Alex’s mom’s. Can’t have too many recipes for cranberry sauce! I love cranberries and buy extra when in season and this year I started canning to open in the middle of summer, supper easy boiling water bath. I used to LOVE the canned cranberry sauce when I was little, but what kid wouldn’t – it’s basically thick Jell-O! Sort of. Now the thought of it makes me shudder and I have to have homemade, whole-cranberry sauce. I nab bags and keep it in the freezer and do just as you mentioned – use them throughout the year. One of the ways I like to use them is directly from the freezer in chocolate chip pancakes, dropping a few right onto the batter while they’re cooking. They’re also good along with roasted brussels sprouts and root veggies. Add a few to a smoothie for their antioxidants. And yes, we’ve done the yogurt thing – so good! Anyhoo, I like to play around with the basic bag recipe, sometimes adding chopped apples for fun. I like to do more orange juice, though (half water, half juice), then add cinnamon and cloves. We like it pretty tart so I typically halve the sugar. I usually use a more natural sugar like sucanat or coconut palm sugar but for some reason this makes it not set really set up (but we don’t mind). I add Grand Marnier to mine along with orange zest and juice, cinnamon, nutmeg and black pepper. Love putting extra in freezer in snack bags to use throughout the year. Please tell me you’ve tried a version of the bag recipe with bourbon. We use a 1/4 cup bourbon per bag of berries. I’ll be having your orange version this year since I’m pregnant! Add a cinnamon stick for a bit of holiday magic! Just made the boozy cranberries! Wow! So good! Was worried it would have too much sugar, but then I thought “Deb doesn’t like things too sweet and she has never let you down.” so I went ahead and added all the sugar. Glad I did; the recipe is delicious–wonderfully complex flavors–and perfectly balanced. It’ll be the perfect accompaniment to the pork tenderloin I’m making. Born and raised in Massachsetts and yes, we are particular about our cranberry sauce. My family is anyway. The homemade whole cranberry sauce is how I’ve made it for many years, except for the larger pieces of zest – which will happen this year. Before we had nut allergies in the family I added toasted, chopped walnuts, it was delicious! I️have adapted a friends recipe which has cranberries, orange rind, a cinnamon stick and chunks of candied ginger. It is made with one bag of cranberries, half cup of sugar and one half cup each of Cointreau and Port. 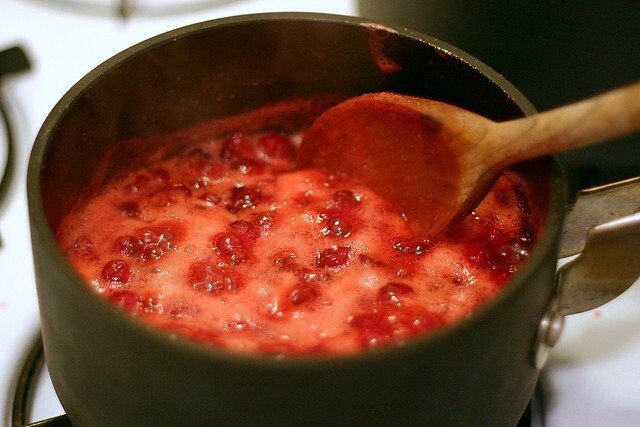 Boil everything until cranberries start to pop and then simmer. You can add the orange rind and ginger to taste. Alex’s mother’s sauce: what size bag frozen mixed berries? So, since I buy large bags of this for my smoothies….how many Cups apox? I always make Williams-Sonoma’s Spiced Cranberry Chutney I don’t see it on their site any more but you can find it on Serious Eats. It has converted quite a few people who have told me they did not like cranberry sauce. I clean my cranberries, drain, put in processor, (without cooking) orange peel, and pecans, Sugar to taste to how sweet you’d like it. And start processor, And bingo, your done. Love it. No cooking, no mess. Deb, since you like cranberries so much I wonder if you have tried Mama Stamberg’s Cranberry Relish as relayed by Susan Stamberg on NPR? If not- you must!